This nice courtyard is located inside the Catholic University's main campus. It really invites to sit and read under the shadow of the trees. And as you can see, we're having more sunny days thanks to the arrival of spring. En effet, cette cour inspire a la relaxation et a la lecture en toute tranquilité. Have you noticed how Catholic Universities the world over have beautiful settings? I love the courtyard. Lovely University. It would make studying a lot easier. Since we are going into the Fall season here in California, I forget others are beginning Spring time. Looking forward to seeing more Spring pictures. Nice architecture. Do you know when the building was built ? Keropok man: This period is not as busy as the rest of the year. That's why the picture looks a little empty. 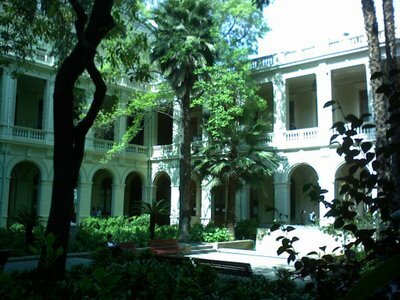 Matthieu: The building is the work of the architect Manuel Cifuentes and began its construction in 1902.